On Saturday, March 1st, 2008 Nat Geo Channel re aired its documentary which whitewashed Peter Lance’s criticism of the FBI and DOJ in TRIPLE CROSS. For Nat Geo’s description of the program CLICK: As you can see, The DVD cover from the documentary mimics the cover of P.L.’s book with one exception: Patrick Fitzgerald’s picture has been replaced by a shot of NYC on 9/11. This is the result of a rewriting of history done by the NGC and the producer: Towers Productions Inc. (TPI) of Chicago who knuckled under to pressure from three ex-Feds to gut Lance’s investigation of Ali Mohamed and Fitzgerald in the two hour documentary which first aired on August 28th, 2006. 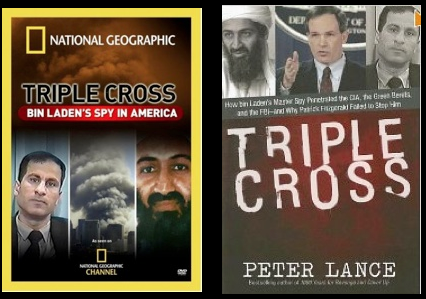 Lance’s association with Towers Productions began in 2005 when TPI interviewed Lance for their four hour NGC documentary INSIDE 9/11 Three months after the program aired in August, 2005, TPI Chairman Jonathan Towers optioned Lance’s latest book TRIPLE CROSS. In December, 2005 Towers flew Lance to Washington D.C. where NGC executives bought a new two-hour documentary to be based entirely on Lance’s book with Lance to serve as narrator, writer and co-executive producer and the program to air in August, 2006 a week before the planned publication of the book. NGC approved a budget for the program of $818,428.00 after Lance wrote a 14 page Treatment based on his research, which Jonathan Towers edited and presented to NGC executives John Ford and Michael Cascio on January 11th, 2006. CLICK for the “One Page Synopsis” from the treatment. The treatment was highly critical of the FBI and DOJ in their failure to stop Al Qaeda master spy Ali Mohamed. But halfway through the production, Jonathan Towers refused to give Lance the interview transcripts of the three former Feds, delaying publication of the book for more than ten weeks. Ultimately, virtually all of Lance’s enterprise reporting critical of Patrick Fitzgerald and the FBI’s bin Laden “offices of origin,” was excised from the documentary, representing one of the most shocking examples of censorship by a television network in years. The full truth can be found in the 670 page book TRIPLE CROSS which can be ordered via amazon.com or barnes&noble.com. But for an immediate overview of the book’s central findings, you can DOWNLOAD a pdf of the 32 page illustrated timeline in the center of the book.